Current knowledge on the cellular basis of cardiac diseases mostly relies on studies on animal models. Here we describe and validate a novel method to obtain single viable cardiomyocytes from small surgical samples of human ventricular myocardium. Human ventricular myocytes can be used for electrophysiological studies and drug testing. Coppini, R., Ferrantini, C., Aiazzi, A., Mazzoni, L., Sartiani, L., Mugelli, A., Poggesi, C., Cerbai, E. Isolation and Functional Characterization of Human Ventricular Cardiomyocytes from Fresh Surgical Samples. J. Vis. Exp. (86), e51116, doi:10.3791/51116 (2014). Cardiomyocytes from diseased hearts are subjected to complex remodeling processes involving changes in cell structure, excitation contraction coupling and membrane ion currents. Those changes are likely to be responsible for the increased arrhythmogenic risk and the contractile alterations leading to systolic and diastolic dysfunction in cardiac patients. However, most information on the alterations of myocyte function in cardiac diseases has come from animal models. Here we describe and validate a protocol to isolate viable myocytes from small surgical samples of ventricular myocardium from patients undergoing cardiac surgery operations. The protocol is described in detail. Electrophysiological and intracellular calcium measurements are reported to demonstrate the feasibility of a number of single cell measurements in human ventricular cardiomyocytes obtained with this method. The protocol reported here can be useful for future investigations of the cellular and molecular basis of functional alterations of the human heart in the presence of different cardiac diseases. Further, this method can be used to identify novel therapeutic targets at cellular level and to test the effectiveness of new compounds on human cardiomyocytes, with direct translational value. Dissection of the electrophysiological properties of the myocardium has progressed markedly after the development of techniques for single cardiac myocyte isolation. Recent advancements in the understanding of cardiac Excitation Contraction Coupling (EC-Coupling) have also been made possible by the capability of isolating viable single cardiomyocytes that retain all the physiological properties of the intact tissue. Patch clamp methods are routinely employed to study the function and pharmacological modulation of cardiac sarcolemmal ion currents. Recordings of intracellular calcium dynamics with Ca2+ sensitive dyes are also regularly performed on single cardiac myocytes from a variety of healthy and diseased models, providing vital data on the physiology of EC-Coupling as well as on the pathological alterations of intracellular Ca2+ homeostasis leading to mechanical impairment and increased arrhythmogenic burden in cardiac diseases. Information from these studies is critical for understanding the electrophysiological and mechanical effects of drugs in the clinical setting. However, there are species specific differences in the transmembrane currents and in the EC-Coupling proteins that account for specific features of cardiac action potential and cardiac mechanics. Thus, while studies of myocytes isolated from non human mammals have elucidated the biophysical properties and physiological roles of specific transmembrane ion channels and EC-Coupling proteins, they do not necessarily provide relevant models of human cardiac myocytes. Isolation of viable myocytes from human myocardium is therefore essential to fully understand the pathophysiology of cardiac diseases and validate novel therapeutic approaches. Human atrial tissue is readily available as atrial appendages are often discarded during surgical procedures. Initial quantitative studies of adult human cardiac action potentials and ionic currents employed enzymatically isolated atrial cells1-4. Recordings of action potentials or currents from isolated adult human ventricular cells have been subsequently reported3,5-10. Most of these studies have used cells obtained from explanted hearts and utilized either collagenase perfusion of a coronary artery segment or exposure of relatively large quantities of excised tissue to collagenase to obtain isolated cells. These studies allowed a detailed characterization of a number of transmembrane ion currents from human ventricular cardiomyocytes from healthy hearts and from patients with terminal heart failure. Recordings of L-type Ca2+ current (ICa-L)5-7, transient outward potassium current (Ito)8, inward rectifier potassium current (Iκ1)8, the different components of delayed rectifier potassium current (Iκ)9 have been reported. Advances and refining of the isolation procedure10, allowed a clear characterization of the ionic basis of the increased arrhythmogenic potential in terminal heart failure, comprising action potential prolongation11, delayed after depolarizations12 and increased funny current13 leading to diastolic depolarization and premature beats. Adult cardiac myocytes are normally isolated from small animals by retrograde perfusion of the whole heart with various enzyme mixtures, a technique that produces high yields of Ca2+-tolerant cells14. Isolation of cardiac myocytes from fragments of tissue is inherently less successful probably because of the limited access of enzymes to individual myocytes compared with that achieved by perfusion of coronary arteries. Because of the very limited availability of unused donor hearts, the only practical way to obtain normal human ventricular cells on a regular basis is by enzymatic digestion of the often very small tissue fragments excised during elective surgical procedures. The only human disease model that has been thoroughly characterized at cell level is terminal heart failure, due to the accessibility to transplanted hearts. However, terminal heart failure occurs in a minority of patients and often involves a common pathway of severe remodeling of myocardial cells, which is relatively independent of the underlying cause15. The ability to assess the function of single cardiomyocytes from patients at an earlier non failing stage of disease is crucial to understand the specific pathophysiology of different inherited or acquired conditions. Hypertrophic cardiomyopathy (HCM) is a telling example. HCM is a common (1/500 individuals) inheritable cardiac condition characterized by cardiac hypertrophy, increased arrhythmogenic risk and contractile alterations due to outflow tract obstruction and diastolic dysfunction16. Cardiomyocytes from HCM hearts undergo a complex remodeling processes involving changes in cell structure (hypertrophy, myofibrillar disarray) and EC-Coupling17. However, most information of myocyte dysfunction in HCM has come from transgenic animal models. Since only a minority of HCM patients evolves toward terminal heart failure and requires cardiac transplantation, HCM hearts are very rarely available for cell isolation with standard methods. However, at least 30% of HCM patients develop obstructive symptoms due to massive septal hypertrophy altering outflow tract blood flow during systole (HCM)18. The most effective available therapeutic option for the relief of obstruction in HCM is surgical septal myectomy: during this surgical procedure, a variable sized portion of upper septum is removed by trans aortic approach. This portion of hypertrophied septum is therefore available for cell isolation from the fresh tissue. A method for the isolation of human ventricular myocytes from single, small transvenous endomyocardial biopsy specimens has been previously developed and published19. We implemented a method to isolate single septal myocytes from ventricular myocardium samples from patients undergoing cardiac surgery, including patients with HCM undergoing septal myectomy and patients undergoing valve replacement procedures. In addition to a detailed description of the isolation protocol, representative electrophysiological and Ca2+ fluorescence measurements are presented, demonstrating the viability of the isolated human ventricular myocytes and the feasibility of patch clamp and intracellular Ca2+ studies. The experimental protocols on human tissue were approved by the ethical committee of Careggi University-Hospital (2006/0024713; renewed May 2009). Each patient gave written informed consent. Solutions are described in Table 1. 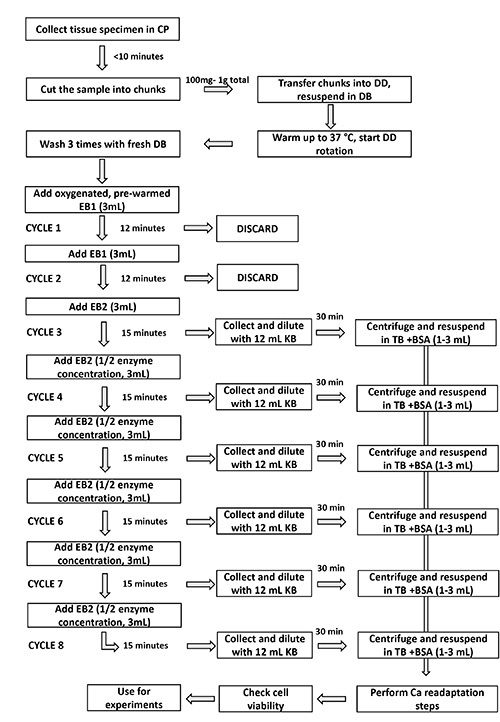 A simplified flowchart of the cell isolation procedure is found in Figure 1. Table 1. Solutions used for specimen collection, cell isolation and functional characterization of myocytes. CP= cardioplegic solution; DB=dissociation buffer; KB= Kraft-Bruhe solution; TB=Tyrode buffer; PS=pipette solution; EB1= enzyme buffer 1; EB2= enzyme buffer 2. Prepare cardioplegic (CP) solution. CP solution can be stored at 4 °C for up to 1 week. Prepare Ca2+-free dissociation buffer (DB). This solution should be used within the day. Prepare Kraft-Bruhe (KB) solution. KB solution can be stored at 4 °C for up to 1 week. Prepare Ca2+-free Tyrode buffer (TB). This solution should be used within the day. Filter all solutions using syringe filters prior to use. 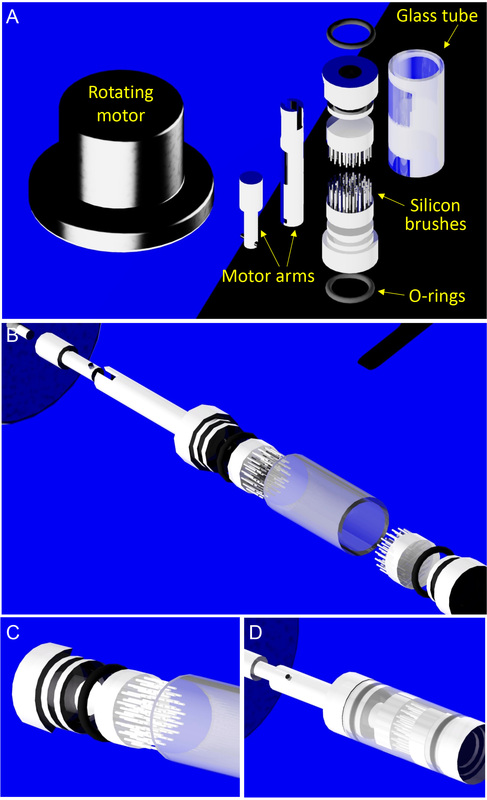 Prepare the digestion device (Figure 2), a scraping container made of two facing brushes of silicone elastomer, one of which rotated by an electric motor. The digestion device is custom made. Details on the digestion device are in Figure 8; images of the device are in Figures 2C and 2D. Wash the tissue chamber with 70% ethanol and water. Pour 40 ml of cardiplegic (CP) solution in a 50 ml tube and store it in ice for specimen transportation from the operative room to the cell isolation lab. Collect the ventricular myocardial specimen from the operative room immediately after excision, wash it with ice cold CP solution and store it in the tube. Use endocardial specimens excised from the upper inter ventricular septum during open heart surgery, weighting >100 mg. Rapidly transfer the specimen to the lab area; start specimen processing within 10 min from specimen excision. While keeping the specimen in ice cold CP buffer, carefully remove the endocardial fibrotic layer using fine scissors under a stereomicroscope; afterwards, cut the myocardial tissue to small pieces (2-3 mm long). Depending on tissue sample size, cut a total amount of ventricular myocardium between 100 mg and 1 g for each isolation. Upon completion of tissue mincing, transfer the myocardial chunks into the digestion device, with clean ice cold CP solution. Avoid filling the whole volume between the two silicon brushes (3-4 ml) with myocardial chunks, using no more than 1 g of total tissue. After the chunks are transferred into the scraping chamber of the digestion device, change the CP buffer in the chamber with cold Ca2+-free dissociation buffer (DB). Place the digestion device in a thermostatic bath, in order for the chamber to be in contact with the heated water in the bath (Figure 1). Set the bath to 37.5 °C and turn it on, in order to slowly raise the temperature of the tissue chamber. Turn on the motor of the digestion device, setting the rotation speed to 1 revolution/second. Perform 3 washing cycles with DB, changing the solution in the chamber with clean DB every 8 min. The DB is warmed (37 °C) and oxygen saturated before getting in contact with the myocardial chunks. Prepare enzyme buffer 1 (EB1) by adding 250 U/ml of Collagenase Type V and 4 U/ml Protease Type XXIV to DB solution. Prepare enzyme buffer 2 (EB2) by adding 250 U/ml Collagenase Type V to DB solution. Warm up (37 °C) and oxygenate EB1 and EB2. Perform two 12 min cycles of digestion in the rotating digestion device with 100% oxygenated EB1 (at 37 °C). At each cycle, use ~3 ml of EB1. Remove the solution by pipette aspiration and discard it after each cycle. Prepare 6 15 ml tubes for cell collection and ~80 ml of cold (4 °C) KB solution for eluting the buffers. Perform a first 15 min digestion cycle with 3 ml 100% oxygenated EB2 at 37 °C. After the digestion cycle, collect the solution containing the first dissociated myocytes in a 15 ml tube and dilute the cell suspension with 12 ml cold KB solution. Store the tube flat at room temperature. Dilute the remaining EB2 solution with an equal amount of DB in order to halve the concentration of collagenase V for the following digestion cycles. Perform other 5 12 min digestion cycles with 3 ml EB2 at 37 °C; after each of them collect of myocyte containing buffer in a 15 ml conical tube and dilute it with 12 ml KB solution. Store the 6 cell containing tubes at room temperature for 30 min. Add 1 mg/ml bovine serum albumin (BSA) to 20 ml Ca2+-free Tyrode buffer (TB). Filter the solution. Centrifuge the six myocyte containing conical tubes at 100 x g for 5 min to force myocytes to settle. Remove the supernatant and resuspend the cells in each tube with a variable amount (1-3 ml, depending on the yield) of BSA containing TB at RT. Gradually increase Ca2+ concentration in the cell containing buffer by adding small aliquots of 100 mmol/L CaCl2 solution. In the first and second steps Ca2+ concentration is raised up to 50 μmol/L and 100 μmol/L, respectively. The following Ca2+ addition steps are performed every 5 min and the concentration is raised by 100 μmol/L at each step to a final concentration of 0.9 mmol/L. Assess the yield of the isolation procedure. Transfer 0.5 ml of myocyte containing solution onto the glass bottom chamber of a microscope. Evaluate 15 microscope fields at 10x objective magnification and calculate the percentage of healthy myocytes (e.g. rod shaped cells with clear striations and no significant inclusions, Figure 2). The expected yield is around 20 %. 5. Functional Evaluation of Isolated Cardiomyocytes. 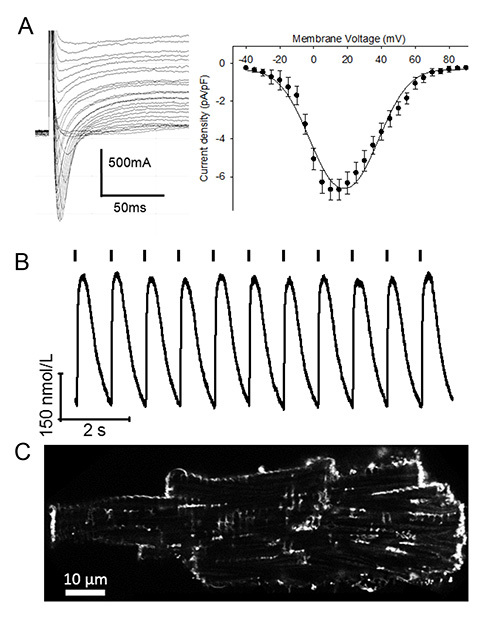 The following protocol is an example of human cardiomyocyte functional assessment including simultaneous recordings of action potentials and intracellular Ca2+ fluxes. Prepare pipette solution (PS) for patch clamp experiments in perforated patch configuration. The solution can be stored at -20 °C for up to 3 months. Add 1.8 mmol/L CaCl2 to Ca2+-free Tyrode buffer (TB). Use this solution for superfusion of cardiomyocytes during patch clamp/fluorescence experiments. Transfer 1 ml of cell suspension to a 1.5 ml tube and add 10 μmol/L Fluoforte and 10 μl Powerload Concentrate. Incubate for 30 min at RT. Afterwards, set the tube in vertical position and leave the cell to settle for 5 min; resuspend the cells in Ca2+ containing TB. Transfer 0.25 ml of cell suspension to a small (0.5 ml), temperature controlled microscope mounted recording chamber, superfused by gravity with a heated microperfusor system at a flow rate of 0.3 ml/min (temperature: 37 ± 0.5 °C). Using a micropipette puller, prepare patch clamp pipettes with a tip diameter of 3 to 5 μm and a resistance of 3 to 4.5 M when filled with PS. Add amphotericin B to a batch of PS (250 μg/ml) and use it to fill the electrodes. Select a rod shaped cell with clear striations, devoid of inclusions, form the giga seal and wait 5 to 10 min, until access resistance drops below 20 MΩ. Elicit action potentials in current clamp mode using short pulses (< 3 msec) at different frequencies of stimulation (0.2 Hz, 0.5 Hz and 1 Hz, 1 min at each frequency). During the recording phase, turn on bright field illumination at 492 ± 3 nm and detect Fluoforte fluorescence at 505-520 nm. Acquire fluorescence and membrane potential signals using Digidata 1440A and pClamp 10.0 software. Repeat the recording sequence multiple times if needed; however, keep the total recording time below 15 min for each cell. The method described above was employed to characterize the functional abnormalities of cardiomyocytes isolated from the interventricular septum of patients with hypertrophic cardiomyopathy (HCM) who underwent myectomy operation, as compared with non failing non hypertrophic surgical patients21. The results contained in this section are derived from that work21 and are shown here as an example of how this technique can be used to characterize the alterations of myocardial cell function in cardiac disease conditions. A representative surgical sample from a patient with HCM is shown in Figure 2A. Surgical samples were extremely variable in terms of size and thickness of the endocardial fibrous streaks. The amount of myocardial tissue that we used for each isolation procedure from HCM samples was around 1g. Instead, the amount of tissue used for control samples was smaller (100-500 mg.), due to lower tissue availability. The yield was significantly higher when control samples were processed with respect to HCM, probably because the relative amount of viable myocardial cells within the tissue is reduced in HCM myocardium and endomyocardial fibrosis is increased22. From these observation we concluded that the required amount of tissue to obtain viable cells may be variable depending on the absence or presence of myocardial disease. Samples were cut into small chunks as shown in Figure 2B. 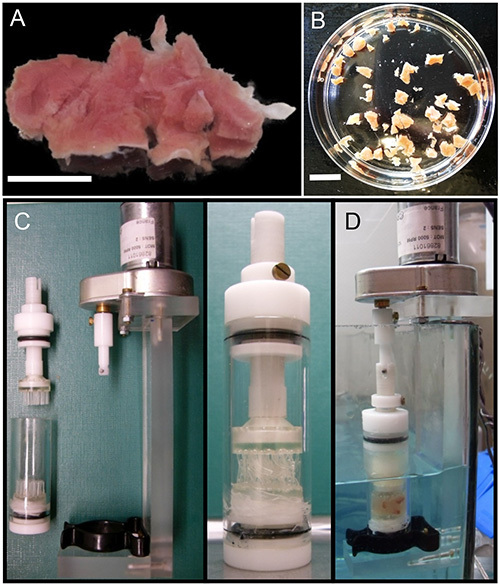 Afterwards, the chunks were transferred into the chamber of the digestion device (Figure 2C) and used for single cell isolation as described above (Figure 2D). 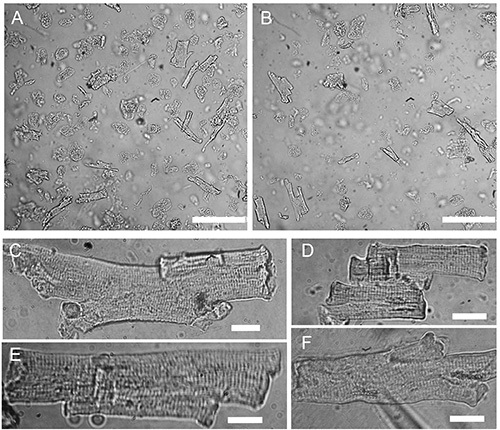 Representative photomicrographs of a cell suspension obtained using the described cell isolation procedure from an interventricular septum sample is shown in Figures 3A and 3B; magnified images of single ventricular cardiomyocytes are depicted in Figures 3C-3F. Cardiomyocytes from HCM samples were used for simultaneous recordings of action potentials and intracellular Ca2+ variations as described in the protocol section. Representative simultaneous traces showing membrane voltage (above) and intracellular Ca2+ (below) during stimulation at 3 different frequencies are shown in Figure 4: these traces were recorded from a single cardiomyocyte isolated from a HCM sample. To test whether longer APD and ion current abnormalities may affect excitation-contraction coupling mechanisms in HCM cardiomyocytes, the properties of intracellular Ca2+ variations were assessed during stimulation. The amplitude of Ca2+ transients evoked in current-clamp conditions were similar in HCM compared to control cardiomyocytes (Figure 6A). Conversely, the kinetics of Ca2+ transient, were significantly longer in HCM (Figure 6B). Additionally, intracellular diastolic Ca2+ concentration was markedly higher in HCM compared to control cardiomyocytes (Figure 6C) and increased more prominently upon increase in stimulation frequency. Notably, cardiomyocytes isolated with this method from human ventricular samples have also been successfully employed for other applications, including voltage-clamp recordings of specific transmembrane currents (Figure 7A), intracellular Ca2+ and/or cell shortening recordings during electrical field stimulation (Figure 7B) and assessment of the fine structure of the sarcolemma using confocal microscopy and membrane-bound fluorescent labels (Figure 7C). Figure 1. Flowchart of cell isolation procedure. Figure 2. Processing of ventricular samples for cell isolation. (A) Representative image showing a sample of ventricular myocardium from a patient with HCM who underwent septal myectomy operation. Calibration bar= 5mm. (B) Chunks of ventricular tissue cut from a ventricular surgical specimen, to be used for cell isolation. Calibration bar= 5mm. (C) Images of the digestion device. The device comprises a digestion chamber with two silicon brushes: the superior brush is able to rotate when moved by a motor. (D) Image showing the digestion device in the thermostated bath during enzymatic digestion of ventricular tissue. Figure 3. Isolated human ventricular cardiomyocytes. (A-B) The panel shows photomicrographs of two microscope fields (10x objective) showing representative cardiomyocyte suspensions. Of note, about 30% of cells are rod shaped and show clear striations. Calibration bar= 100 μm. (C-E) Representative images of 3 human cardiomyocytes isolated from a specimen of an HCM patient (40x objective). Calibration bar= 20μm. (F) Image showing a human ventricular cardiomyocytes touched by the tip of the patch pipette for recordings. Calibration bar= 20μm. Figure 4. Simultaneous recording of membrane potential and intracellular calcium. Representative trace showing membrane potential (above) and intracellular calcium (below) recorded from a single myocyte isolated from an HCM sample. The myocyte is stimulated via the patch pipette at 0.2 Hz, 0.5 Hz and 1 Hz. Figure 5. Alterations of action potentials in ventricular cardiomyocytes from HCM samples. 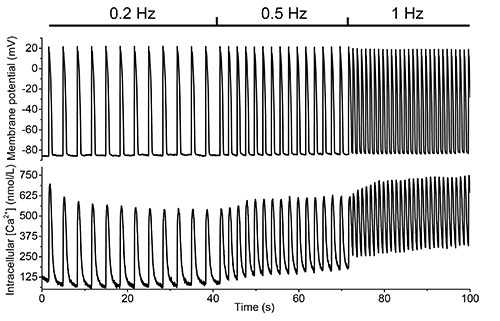 (A) Representative superimposed action potentials elicited at 0.2 Hz, 0.5 Hz and 1 Hz from a control myocyte (left, grey traces) and a HCM myocyte (right, black traces). (B) Average action potential duration at 90% repolarization (APD90%) in HCM (n=81) and control cardiomyocytes (n=29) at the three pacing frequencies tested. (C) Occurrence of EADs in cardiomyocytes from HCM patients and control samples. (D) Superimposed action potentials at 0.5Hz from a control myocyte in the absence (continuous trace) and in the presence of 10-7 M isoproterenol. (E)Representative trace showing membrane potential of a cardiomyocyte from an HCM patient displaying several spontaneous depolarizations occurring during the plateau phase (early after depolarizations, EADs), marked by arrows. Stimuli are marked by short lines below the trace. **=p<0.01 unpaired t-test. All panels in the figure are modified with permission from Coppini et al. 201221. Figure 6. Alterations of calcium transients in ventricular cardiomyocytes from HCM samples. (A) Representative superimposed calcium transients elicited during stimulation at 0.2 Hz via the patch pipette in a control myocyte (grey) and an HCM cell (black). 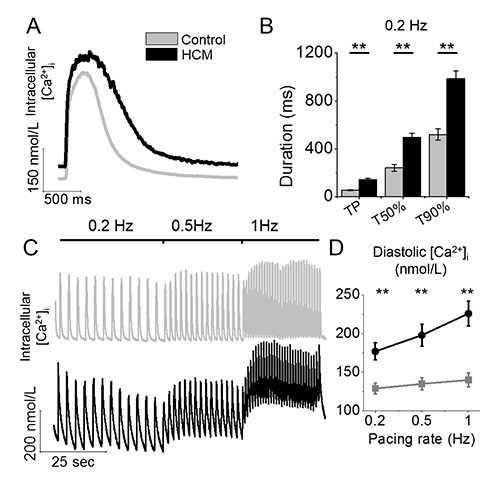 Notably, the amplitude of Ca2+ transients does not differ between the two cells. (B) kinetics of Ca2+ transients in HCM (n=42) and control (n=24) cardiomyocytes: time from stimulus to peak transient (TP), time from peak to 50% decay (T50%) and time from peak to 90% decay of transient (T90%) are shown. (C) Representative long traces showing intracellular Ca2+ during stimulation at 3 different frequencies in HCM and control myocytes, highlighting the increased diastolic Ca2+ at high pacing rates in the HCM myocyte. (D) Average diastolic Ca2+ in HCM (n=42) and control (n=24) cardiomyocytes at 3 different pacing rates. **=p<0.01 unpaired t test. All panels in the figure are modified with permission from Coppini et al. 201221. Figure 7. Additional experimental applications using human ventricular myocytes. (A) Left: representative superimposed traces showing L-type Ca2+ current recorded under voltage clamp at different membrane voltages with a specific protocol (see21 for details). Right: average L-type Ca2+ current peak density from 18 cells isolated from HCM samples at different membrane. Voltages. (B) Intracellular Ca2+ trace recorded from a ventricular myocyte during electrical field stimulation at 1 Hz. (C) Confocal image of a ventricular cardiomyocyte from a HCM sample stained with a fluorescent membrane bound dye (Di-3-ANEPPDHQ). Of note, the density of ttubules is low, suggesting morphological membrane remodeling in HCM. Figure 8. The digestion device. (A-B) Components of the digestion device. A variable-speed rotating motor is connected to a first plastic arm, which is connected to a second one. The second plastic arm is removable and connected to the upper brush. Brushes are made with silicone elastomer. A PTFE negative mold, with 100 holes spaced ~1.5 mm was used to cast the brushes from liquid silicone. The inner space of the mold has 1.9 cm diameter and is 6 mm thick, producing brushes of the same size. The holes located on one side of the mold are made in order to produce 8 mm long bristles when the brushes are cast and removed from the mold . After the liquid silicone is put into the mold, at least 48 h are needed for complete hardening. Brushes are mounted inside a glass tube (inner diameter= 2 cm; thickness 2 mm) and the cylindrical chamber formed by the two brushes and the glass walls is hermetically sealed by two rubber O-rings. Brushes need to be pushed one to the other; the bottom one is glued on a plastic base, while the upper one is glued to the plastic end of the motor arm and thus is able to rotate. (C) Magnified views of the upper brush. Of note, the brush needs to be glued to the end of the motor arm in order for it to rotate (D) The components of the chamber are shown in their final position. The space between the two brushes (the actual chamber) is ~2 cm wide and 7-8 mm high; this space easily fits 3-4 ml of buffer, other than up to 1 g of myocardial tissue. We have described and validated a method to isolate viable myocytes from surgical samples of human ventricular myocardium. Starting from previously described protocols that had been successfully used to isolated cells from atrial surgical samples, the technique to allow separation of single viable myocytes from diseased ventricular myocardium was developed and fine tuned. Early reports showed that isolation of single cardiomyocytes from chunks of atrial and ventricular tissue selectively impaired repolarizing potassium currents, resulting in altered electrophysiological properties and responses to physiological stimuli8,24, whereas delivery of the enzyme containing buffer via coronary perfusion did not impair delayed rectifier currents in isolate cells25. Unfortunately, isolation of human ventricular myocytes from surgical specimens of ventricular myocardium cannot be performed by coronary perfusion since the integrity of coronary branches is lost, at variance with explanted hearts. Cardiomyocytes isolated from myocardial chunks using our method display a clear adaptation of action potential duration in response to changes of pacing frequency or to β adrenergic stimulation. In order for such responses to occur, the integrity of delayed rectifier potassium channels is required26-28, suggesting the overall integrity of those channels is not impaired by our isolation method. Additionally, cells isolated with our methods not only show regular electrophysiological responses (Figures 3 and 4), but also display calcium transients of the expected shape and duration (Figures 3 and 5) and regular sarcomeric organization (Figure 2) and shortening properties (not shown), suggesting that the overall structural integrity of those cells is preserved by this isolation procedure. The main advancement of this method over previous techniques is provided by the newly designed digestion device, which delivers gentle mechanical stirring of tissue chunks, allowing single cell separation without excessive damage. Moreover, the use of the digestion device allowed us to employ a lower concentration of enzymes in the cell isolation buffer; in particular we are using a much lower concentration of unselective protease in comparison with previously reported methods24. The device is custom made in our laboratory: building schematics are presented in Figure 8. The simple design and structure makes it very easy to replicate for a successful outcome of this protocol. The legend to Figure 8 also describes the procedures required for producing the silicone brushes and building the scraping chamber. Owing to the advantages of the digestion device, a relatively high number of viable cells can be obtained from a relatively low amount of ventricular tissue (as low as 100 mg). A previously published method19 was shown to provide a calcium tolerant myocytes from small biopsies (even < 20 mg). However, the reported myocyte yield was very low and the authors did not show whether cells isolated with that method were feasible for characterization of intracellular calcium cycling and contractile function. This technique is potentially applicable to many surgical patients, since small portions of the interventricular septum are frequently excised during valve replacement procedures (e.g. aortic valve replacement). However, the crucial point to obtain a successful isolation is a rapid initiation of the procedure after sample collection from the operating room. Therefore, it is required for the cell laboratory to be in close proximity to the cardiac surgery clinic, in order for this technique to be fruitful. Additionally, a proper enzyme activity is also extremely important for a successful isolation. Since the unselective protease activity of each collagenase batch is usually not entirely tested, each lot is likely to perform differently during cell isolation. It is therefore essential to fine tune the final concentration of collagenase in order to achieve the best results. We suggest observing cell suspension under the microscope at each cycle, in order to be sure that viable cells start appearing at cycle 3. Early appearance of cells suggests excessive enzyme activity and prompts towards reduction of enzyme concentration; appearance of cells after cycle 3 suggests insufficient enzyme activity. In our experience, this is the most effective indicator of the correct enzyme concentration. We have successfully used this method to obtain single cardiomyocytes from the inter-ventricular septum of HCM patients with left ventricular outflow tract obstruction undergoing surgical septal myectomy, as well as from non-failing non-hypertrophic surgical patients21. Results from that paper show that myocytes isolated with this method can be employed for complete electrophysiological evaluation with patch clamp techniques while simultaneously assessing EC-coupling abnormalities, by recording intracellular calcium dynamics with fluorescent dyes. The recording procedure here described allowed us to collect several physiological cell parameters with a single recording from each cell, thus producing a large amount of data with a limited number of cells and samples. Thanks to these advantages, this method has been successfully used to characterize the specific functional abnormalities of ventricular cardiomyocytes from HCM patients, as compared with non hypertrophic patients21. Abnormalities of ion currents and action potential duration, as well as kinetic anomalies od intracellular Ca2+ cycling were clearly identified using this technique, with high reproducibility. In addition, we have shown that treatment with a selective inhibitor of late Na+ current ranolazine significantly ameliorated the electrical and mechanical function of HCM myocardium, suggesting important therapeutic implications. This result highlights the possibility of employing human cardiomyocytes from patients with cardiac diseases for drug testing, allowing a direct translation of the results to the clinical setting. Indeed, results from the aforementioned work led to the development of a double blind clinical trial with ranolazine vs. placebo in patients with HCM29, which is currently ongoing. Human cardiac specimen availability is relatively modest, even in specialized centers, and this may limit a wide applicability of this technique. Nonetheless, the quality of information that can be directly obtained from patient samples on disease related changes in cardiomyocyte function is comparable to that achievable from animal models of HCM and other cardiac diseases. Given the extensive differences between the physiology of human and murine cardiac myocytes, data from functional evaluation of human myocytes can be extremely valuable. As conclusion, we believe that future applications of this technique can significantly contribute to the knowledge of cardiac diseases, since our protocol provides the possibility to perform a complete set of functional assessments directly on cells from patient samples, with immediate translational value. This work was supported by the E.U. (STREP Project 241577 "BIG HEART," 7th European Framework Program, CP), Menarini International Operations Luxembourg (AM), Telethon GGP07133 (CP) and Gilead Sciences (AM). Digestion Device CUSTOM CUSTOM The device is custome made in our laboratory using plastic tubes, cast Sylgard and a motor; it is described in detail in Figure 1C-1D and in Figure7. We can provide further details if requested. Mold for brushes casting N.A. N.A. The mold is custom made from standard PTFE 2.5 cm diameter rods. Dow, J. W., Harding, N. G., Powell, T. Isolated cardiac myocytes. I. Preparation of adult myocytes and their homology with the intact tissue. Cardiovascular Research. 15, 483-514 (1981). Dow, J. W., Harding, N. G., Powell, T. Isolated cardiac myocytes. II. Functional aspects of mature cells. Cardiovascular Research. 15, 549-579 (1981). Harding, S. E., et al. Species dependence of contraction velocity in single isolated cardiac myocytes. Cardioscience. 1, 49-53 (1990). Bustamante, J. O., Watanabe, T., Murphy, D. A., McDonald, T. F. Isolation of single atrial and ventricular cells from the human heart. Canadian Medical Association Journal. 126, 791-793 (1982). Beuckelmann, D. J., Nabauer, M., Erdmann, E. Characteristics of calcium-current in isolated human ventricular myocytes from patients with terminal heart failure. Journal of Molecular and Cellular Cardiology. 23, 929-937 (1991). Beuckelmann, D. J., Nabauer, M., Erdmann, E. Intracellular calcium handling in isolated ventricular myocytes from patients with terminal heart failure. Circulation. 85, 1046-1055 (1992). Cohen, N. M., Lederer, W. J. Calcium current in single human cardiac myocytes. Journal of Cardiovascular Electrophysiology. 4, 422-437 (1993). Beuckelmann, D. J., Nabauer, M., Erdmann, E. Alterations of K+ currents in isolated human ventricular myocytes from patients with terminal heart failure. Circulation Research. 73, 379-385 (1993). Virag, L., et al. The slow component of the delayed rectifier potassium current in undiseased human ventricular myocytes. Cardiovascular Research. 49, 790-797 (2001). Nanasi, P. P., Varro, A., Lathrop, D. A. Isolation of human ventricular and atrial cardiomyocytes: technical note. Cardioscience. 4, 111-116 (1993). Benitah, J. P., et al. Slow inward current in single cells isolated from adult human ventricles. Pflugers Archiv. European Journal of Physiology. 421, 176-187 (1992). Verkerk, A. O., et al. Ionic mechanism of delayed afterdepolarizations in ventricular cells isolated from human end-stage failing hearts. Circulation. 104, 2728-2733 (2001). Cerbai, E., et al. Characterization of the hyperpolarization-activated current, I(f), in ventricular myocytes from human failing heart. Circulation. 95, 568-571 (1997). Kohncke, C., et al. Isolation and kv channel recordings in murine atrial and ventricular cardiomyocytes. Journal of Visualized Experiments: JoVE. (2013). Tomaselli, G. F., Marban, E. Electrophysiological remodeling in hypertrophy and heart failure. Cardiovascular Research. 42, 270-283 (1999). Maron, B. J. Hypertrophic cardiomyopathy: a systematic review. JAMA: The Journal of the American Medical Association. 287, 1308-1320 (2002). Olivotto, I., et al. The many faces of hypertrophic cardiomyopathy: from developmental biology to clinical practice. Journal of Cardiovascular Translational Research. 2, 349-367 (2009). Maron, M. S., et al. Hypertrophic cardiomyopathy is predominantly a disease of left ventricular outflow tract obstruction. Circulation. 114, 2232-2239 (2006). Peeters, G. A., et al. Method for isolation of human ventricular myocytes from single endocardial and epicardial biopsies. The American Journal of Physiology. 268, 1757-1764 (1995). Lippiat, J. D. Whole-cell recording using the perforated patch clamp technique. Methods Mol Biol. 491, 141-149 (2008). Coppini, R., et al. Late sodium current inhibition reverses electromechanical dysfunction in human hypertrophic cardiomyopathy. Circulation. 127, 575-584 (2013). Kuusisto, J., et al. Low-grade inflammation and the phenotypic expression of myocardial fibrosis in hypertrophic cardiomyopathy. Heart. 98, 1007-1013 (2012). Yan, G. X., et al. 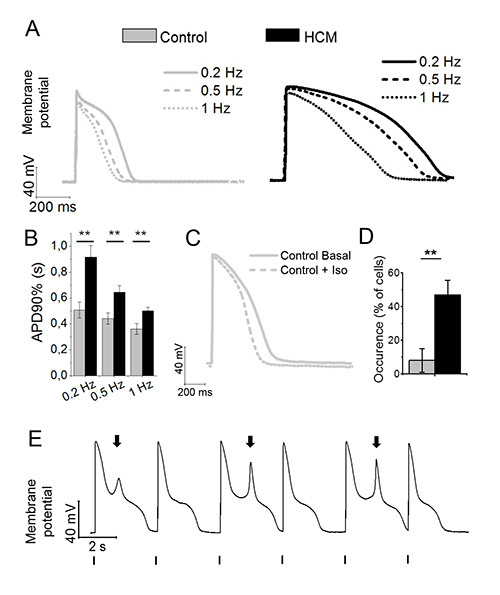 Phase 2 early afterdepolarization as a trigger of polymorphic ventricular tachycardia in acquired long-QT syndrome : direct evidence from intracellular recordings in the intact left ventricular wall. Circulation. 103, 2851-2856 (2001). Yue, L., Feng, J., Li, G. R., Nattel, S. Transient outward and delayed rectifier currents in canine atrium: properties and role of isolation methods. The American Journal of Physiology. 270, 2157-2168 (1996). Li, G. R., Feng, J., Yue, L., Carrier, M., Nattel, S. Evidence for two components of delayed rectifier K+ current in human ventricular myocytes. Circulation research. 78, 689-696 (1996). Viswanathan, P. C., Shaw, R. M., Rudy, Y. Effects of IKr and IKs heterogeneity on action potential duration and its rate dependence: a simulation study. Circulation. 99, 2466-2474 (1999). Volders, P. G., et al. Probing the contribution of IKs to canine ventricular repolarization: key role for beta-adrenergic receptor stimulation. Circulation. 107, 2753-2760 (2003). Sanguinetti, M. C., Jurkiewicz, N. K., Scott, A., Siegl, P. K. Isoproterenol antagonizes prolongation of refractory period by the class III antiarrhythmic agent E-4031 in guinea pig myocytes. Mechanism of action. Circulation Research. 68, 77-84 (1991). Coppini, R., et al. A translational approach to treatment of hypertrophic cardiomyopathy: pre-clinical rationale and design of a prospective randomized pilot trial with ranolazine. Circulation. 125, 1 (2012).